Tukdrub Terkha Dündü, (Tib. ཐུགས་སྒྲུབ་གཏེར་ཁ་བདུན་འདུས་པ་, Wyl. thugs sgrub gter kha bdun 'dus pa ) ‘The Collected Seven Treasures Guru Sadhana’,  is an elaborate Guru yoga practice revealed and compiled by Dudjom Rinpoche at the request of Yeshe Tsogyal. Guru Chöwang, the Gathering of Secrets (Sangwa Düpa). Dorje Lingpa, the Gathering of the Eight Commands (Kagye Düpa). Ratna Lingpa, the Gathering of the Innermost Essence (Yang Nying Düpa). Padma Lingpa, the Gem Ocean (Norbu Gyatso). Shikpo Lingpa, the Gathering of Victorious Ones (Gyalwa Düpa). Düdül Lingpa, the Complete Gathering of Enlightened Intent (Gongpa Yong Dü). Dudjom Rinpoche, the Complete Gathering of Sugatas (Deshek Yong Dü). The Tukdrub Terkha Dündü is a particularly beneficial practice for this degenerate time when it is so difficult to receive and practice each guru yogas of many different lineages. By combining the termas lineages from seven tertöns, including himself, Dudjom Rinpoche has made it possible to practice and maintain several lineages which were in danger of disappearing. It is said that practicing Thugdrup Terka Dundü is the same as practicing all seven simultaneously. The Noble Vase of Empowerment That Confers Blessing, A Prayer of the Lineage of the Practice that Unites All Heart Sadhana of the Guru, a lineage prayer composed by Sangye Dorje (aka Chadral Rinpoche. Tukdrup Sangwa Düpa, The Daily Practice of the Gathered Secret Heart Essence of the Guru, written by Dudjom Rinpoche, Jigdral Yeshé Dorjé upon the request of Pema Yeshé Palmo. Source: Dudjom Sung Bum, Volume AH (30). Bero Jeydren Publications, 1997, 2010. The kings of all the guru sadhanas that have been revealed as hidden treasures are the Gathering of Secrets (Sangwa Düpa) of Guru Chöwang, the Gathering of the Eight Commands (Kagye Düpa) of Dorje Lingpa, the Gathering of the Innermost Essence (Yang Nying Düpa) of Ratna Lingpa, the Gem Ocean (Norbu Gyatso) of Padma Lingpa, the Gathering of Victorious Ones (Gyalwa Düpa) of Zhigpo Lingpa, and the Complete Gathering of Enlightened Intent (Gongpa Yon Dü) of Düdül Lingpa. In addition, there is the dharma cycle entitled Complete Gathering of Sugatas (Deshek Yong Dü) which has fallen to me [Dudjom Rinpoche] as my lot. Although the later has not been revealed from its place of concealment as an earth treasure, it remains in accord, in both word and meaning, with foregoing cycles as regards their ultimate enlightened intent, and partakes as well of the blessings of the ultimate lineage. People may wish to practice in a manner that combines these seven treasures caches, revealed at earlier and later points in time, flowing as single river. In the center, Guru Rinpoche. Above, the three kayas forms of Guru Rinpoche: Amitabha (Dharmakaya), Avalokiteshvara (Sambhgakaya) and Tsokyé Dorje, Guru Rinpoche with yum Mandarava (Nirmanakaya). Around them are the holders of seven different lineages of guru sadhana of Padmasambhava. * Below the main figure of Guru Rinpoche is Hayagriva with Varahi in union. Then around the main figure there are eight forms of Padmasambhava, four Thothrengs (four families of GuruRrinpoche) and four ging in union with dakinis. At the bottom there are the Dharma Protectors. The “Collection of Seven Treasures (Ter Kha Dun Dü) text was passed to Dudjom Rinpoche directly by Khandro Yeshe Tsogyal. It was Yeshe Tsogyal who asked Dudjom Rinpoche to compose this specific text. Yeshe Tsogyal is the crown ornament of ten million dakinis. She is the teacher who has been the most kind to all of the Tibetan people. And it is she who appeared in a vision to Dudjom Rinpoche, who himself is like the monarch of Dharma within the three realms of beings. He is our supreme spiritual guide. Yeshe Tsogyal appeared in a vision to Dudjom Rinpoche and told him that this was the time for him to compose this text that gathers together six previous treasures as well as Dudjom Rinpoche’ s own terma of practice of Guru Rinpoche. This then is this very holy, important, vital practice that we are all doing here together. 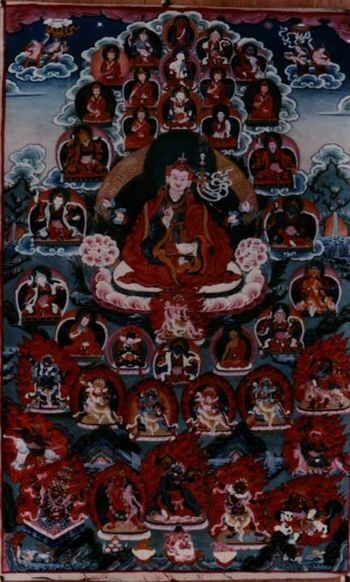 One reason this Thugdrub Terka Dundü, “Collection of Seven Treasures” practice of Guru Rinpoche is so special is that it gathers together seven different treasure lineages into one. This is through the kindness, once again, of Yeshe Tsogyal, who asked Dudjom Rinpoche to do just that. You can imagine, if we didn’t have this practice, that it might be possible, here in the West, for some people to find a few of those lineages, but probably not all of them. The same is true even in Tibet. Some of those lineages would be accessible to people, but rarely would they be able to gather all seven together. Thanks to the kindness of Yeshe Tsogyal, however, all the blessing and the power of all those seven lineages have been gathered within this single practice. ↑ The Celebrating Providing All Wished-For Siddhis, An Activity Ritual for the Heart Sadhana of the Lama, Bero Jeydren Publications, 2000. ↑ Lama Tharchin Rinpoche, A Teaching on Drupchen based on the Thugdrub Terka Dundü, June 29, 2006, Pema Osel Ling, USA. This page was last edited on 16 August 2018, at 10:06.